What do brown spots and crisp foliage mean for these once lush Indian Hawthorn shrubs? Find out! On a recent site visit at a client’s home we noticed an all too common sight around Dallas right now: damaged Indian Hawthorn shrubs. These once lush evergreen shrubs were covered in both crisp, brown leaves and foliage covered in black, roundish spots. Our diagnosis? Freeze damage coupled with a historic battle with a common fungal disease called Entomosporium Leaf Spot (ELS). While Entomosporium Leaf Spot is mostly dormant for the winter, the spots show clearly that the plant has been heavily infected during the previous growing; the infection most likely began last year after a rainy spring. The fungal disease made the plants more susceptible to freeze damage this winter. While we didn’t have a lot of cold weather, we did have a few hard freezes that followed warm weather. When plants aren’t acclimated to the cold, you’ll often see more freeze damage, or lose more plants when hard freezes do happen. ELS is treatable. Though, plants affected by it (most commonly Indian Hawthorns, Pear, Quince and Photinias here in DFW) have a hard time recovering once severe damage has occurred. If the problem becomes chronic we usually recommend pulling out the shrubs and replacing them with a different plant that is better suited to the location. Why did ELS attack your plants? Mild winters and warm, wet springs have created the perfect environment for this fungal disease to spread and thrive. It passes from leaf to leaf in splashes of water, then enters the plant through the leaves. Sun loving plants, such as Indian Hawthorn, that get too much shade will be more susceptible to fungal diseases. Overwatering your plants, or watering then in the evening, can encourage faster spread of fungal diseases such as ELS. Look for tiny red spots on plant leaves, sometimes with a yellow ring around them. Spots can grow so large over time the spots cover the entire leaf and get darker. The best prevention is to choose the right plants for the sun exposure, then be sure to manage your watering schedule properly so as not to encourage the disease. Water the soil, not the foliage of your shrubs. Try water in the morning to give plants time to dry during the day. Dry foliage reduces the spread of fungal diseases. Once leaves are infected, they cannot be treated and saved. Instead, remove any leaves with spots. Don’t add them to the compost pile or you could spread the disease through the compost and back to your plants. Bag the infected leaves and add to the trash instead. Infected leaves that have dropped around the base of plants should be cleaned up quickly and disposed of to reduce spread of the disease. Reduce pruning in summer months and always sterilize your pruners between plants, if your plants are infected with a fungal disease. Use a copper fungicide, or other natural fungicide labeled for the treatment of ELS, on the rest of the plant and uninfected foliage. You will need to reapply based on the label instructions. 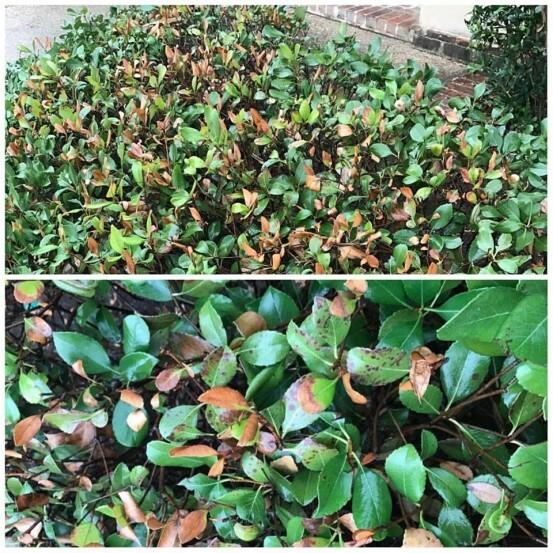 Could your landscape shrubs be infected with a fungal disease? Our Pest and Disease ID Guide is ready to help you grow healthier garden here.